Beau Haines talks about the benefits of living in a 'tiny home' inside the first of many tiny house installments at the Hideout Creekside Village located off Midland Avenue in south Glenwood. Hideout Creekside Village was once part of the Midland Railroad, where coal was transported from the Sunlight Mine down to the county road now known as Midland Avenue in Glenwood Springs and onto the main rail line. In 1888, a fur trader purchased that railroad and built a series of cabins and storage spaces spanning the next 20 to 30 years. Now, the campground, which has housed more than 40 RVs, is changing once again. This time, its pioneers are looking to create a more affordable space with a greater sense of community. Beau Haines and Zach Frisch are the owners of the aforementioned historical property, Hideout Cabins & Tiny Home Community and they both have ties to the site, as both have lived in the area for 20-plus years. Eighteen months ago, they decided to make their “dual vision” a reality by spearheading a plan to build a series of tiny homes in what is now a close-knit RV park. The goal, they say, is to create a more affordable, flexible living space for people who desire a stable lifestyle in the valley. “Housing in Glenwood Springs is terrible,” Haines said, noting that the median price of a home in the valley is $465,000. “Anyone who has moved here within the last four or five years understands how difficult it is to find a place to live, especially some place that’s nice, efficient, and affordable,” he said, emphasizing that the tiny homes he’s bringing in are exactly that. 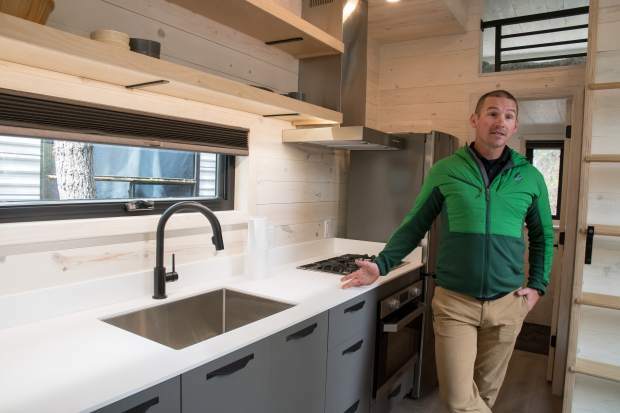 Standing in the first tiny home already located on the site, he said it offers not only high-end appliances, but affordable and sustainable living options. He and his family currently live in the 364-square-foot home, and add that utility bills cost $18 to $22 a month. The home has a full bathroom, a washer and dryer, a toilet, multiple sleeping areas, storage spaces, and a full kitchen. “Quite literally it’s got everything you’d get in a condo without hearing your neighbors,” he said. He and Frisch are soon hosting their first open house to show the tiny home, which arrived at the space last Sunday. He says anyone is allowed to attend the showing on May 12 from 10 a.m. to 6 p.m., since not many people are aware the project exists yet. The campground currently houses 42 RVs and 42 tiny homes will replace those RV’s once the project is finished. Haines and his girlfriend Rachel Thomas say they expect most of the community already living in the park to move aboard the tiny homes once they’re all built. The new homes, which he hopes will be finished in the next 36 months, are not limited to current residents already living in the park. These will be the first tiny homes in Garfield County, and Haines says his biggest hope is to change the stigma around people living in trailer homes. He says building this new community will hopefully “crush the stigmas of the past, of the old transient, RV parks” that people still envision when they think back to the 1960s and ’70s. “We want to make sure everything is just like it would be in a high-end apartment, except cheaper and quieter and more community based. Having this here and being able to show exactly what our vision is, is going to help,” Haines said.